The 2014 NFL Draft commences on Thursday night as the first 32 members of the 2014 rookie class will be welcomed into the National Football League. As the defending Super Bowl champions, the Seahawks are currently slotted to pick 32nd in the first round of the draft; the last pick of the first round. After scouting over 250 players that attended the scouting combine, I analyzed game film of 75 of these players, ultimately whittling this list down to 35 players I would like to see the Seahawks draft over the course of this weekend. 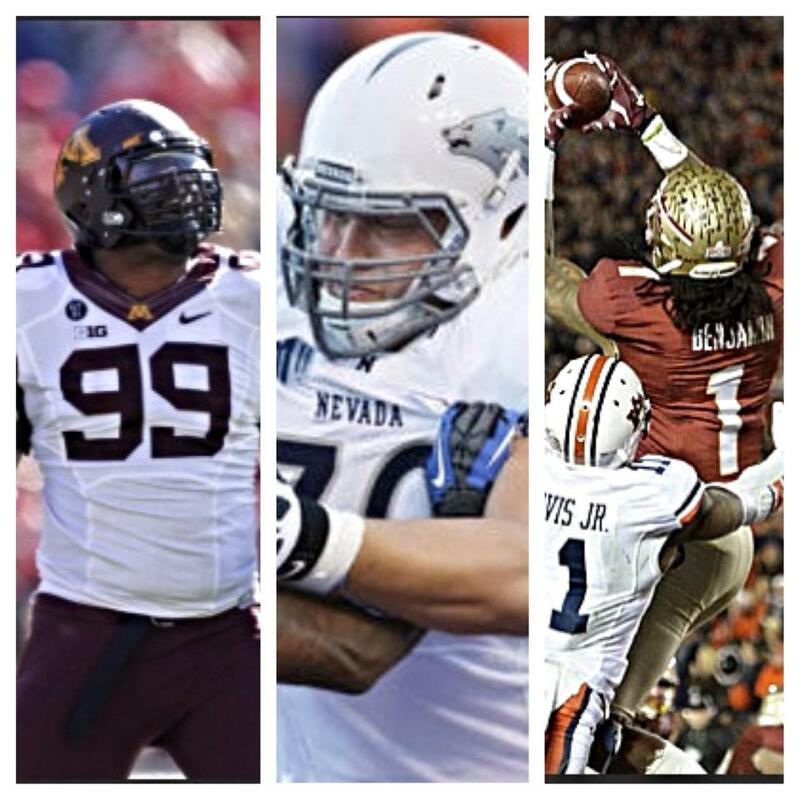 Barring a trade either up the board or down and out of the first round entirely, here are three players I would like to see the Seahawks select at #32. Ra’Shede Hageman (DT, Minnesota): I believe the Seahawks will have the opportunity to draft both the best player available at #32 and a player at a position of need if Minnesota defensive tackle Ra’Shede Hageman is still on the board. Hageman would be a perfect fit along our defensive line and could be a potential replacement to Red Bryant. Hageman stands 6 feet, 6 inches tall and weighs in at 311 pounds. These numbers justify his positional fit as a defensive tackle but his speed justifies why he could be a defensive tackle/defensive end hybrid like Bryant. Hageman has one of the best bursts off the line of scrimmage of any first round defensive line prospect and can penetrate the offensive line well. Hageman is a very good fundamental tackler and has good instincts to know how a play will progress. Beating blocks is his strong suit as he does a very good job shedding blocks and being the first defender to the ball carrier on running plays. A defensive line with Hageman, Tony McDaniel, Brandon Mebane, and Michael Bennett could be a force to be reckoned with, especially on first and second down. Joel Bitonio (OG, Nevada): In the first round of the draft it is very important to add depth to both the defensive line and the offensive line. In the Pete Carroll/John Schneider era the Seahawks have drafted 3 offensive linemen within the first three rounds of the draft, 2 of which coming in round one (Russell Okung, James Carpenter). At #32 the Seahawks could be in the market to take an offensive lineman and I think the best fit in this spot is Nevada guard Joel Bitonio. Bitonio has been climbing draft boards over the past couple of weeks and the earliest I have seen him go in any mock draft is #26 to the Carolina Panthers. Perhaps the most uncertain position along the Seahawks offensive line is left guard and Bitonio could add solidarity to a unit that had a difficult time keeping Russell Wilson consistently clean over the course of the 2013 season. Among Bitonio’s strengths, he has very good balance and does not allow himself to get bullied by his man. He is a very good pass protector and after watching film I could see strengths in zone blocking on running plays. Bitonio does not collapse the pocket on his own (something Carpenter has struggled with mightily over the course of his career) and Bitonio also works well with the other four guys on the offensive line. Kelvin Benjamin (WR, Florida State): Understand that the Seahawks are high on both Jermaine Kearse and Ricardo Lockette but with the departure of Golden Tate during free agency, the Seahawks could be in the market to draft another wide receiver. In a draft flooded with wide receiver talent, another toy for Russell Wilson to play with could be the decision Carroll and Schneider come to at #32. If the Seahawks go with a skill position player at #32 my hope is that player will be Florida State wide receiver Kelvin Benjamin. Benjamin is one of the tallest receivers available which means he will be a matchup problem with most cornerbacks in the league. Benjamin makes fantastic adjustments on the ball while the pass is still in the air and his upper body strength makes it hard for just one defender to tackle him. Benjamin looks the ball into his hands and dropped passes are rare. In addition to being a “raw” prospect there are two areas where Benjamin struggles. He sometimes mistimes his jumps and his ball security is average and must improve. 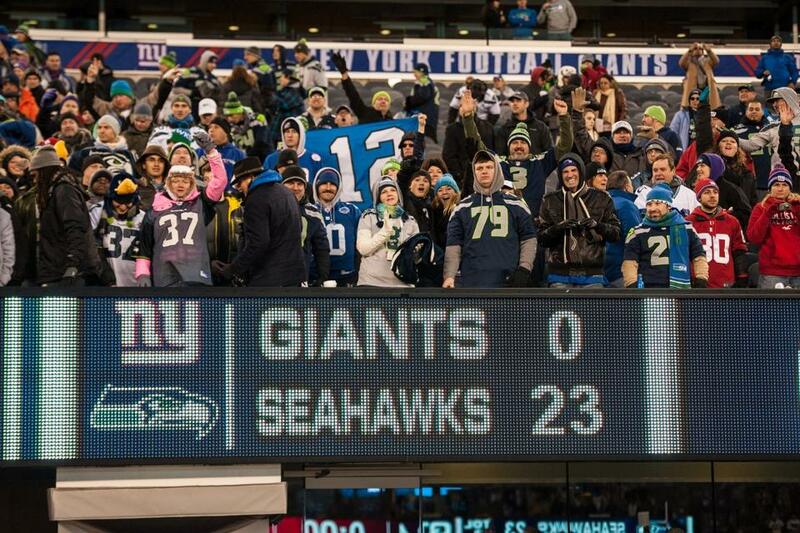 That may have been the most nail-biting, exciting, nauseating, thrilling Seahawks game I have ever been to. The Seattle Seahawks are heading to New York for Super Bowl XLVIII after defeating the San Francisco 49ers 23-17 in the 2013 NFC Championship Game. I honestly do not believe I have ever been on an emotional roller coaster quite like the one I rode for just over three hours on Sunday afternoon. Up next, the Denver Broncos and a crazy two weeks preceding it. For now however, this is what I took out of this game and what needs to happen as we move closer to the biggest game in Seahawks history. They Kept it Clean: One of the worries heading into this game was how the officials would call it. Many including myself thought that the potential chippy-ness would lead the referees to call the game tighter, allowing the Seahawks to possibly be subject to many questionable calls. All in all the game was not officiated as tight as I thought it would, especially in the secondary. No member of the Legion of Boom was called for pass interference. The only Seahawks penalty in the secondary was a holding call on Richard Sherman in the first half which led to an Anthony Dixon touchdown and a 10-0 San Francisco lead. Other than that one holding call no penalties significantly hurt Seattle in this game and there were no plays that could be “questionable” calls for the duration of the game. Gene Steratore and his officiating crew did a great job of letting the players play; the referees did not dictate the shaping of the game. Taking Shots: And no I’m not talking about Fireball. I wanted to see Russell Wilson take more shots down the field this week and he did a much better job of stretching the field than last week. Although he still seemed confused and indecisive at times, Wilson went deep several times on Sunday. On vertical passes that traveled more than 20 yards in the air, Wilson went 3/5 connecting with Doug Baldwin on receptions of 22 and 51 yards and Jermaine Kearse on a 35-yard touchdown pass. The Seahawks had been playing very conservatively over the past few weeks which is a small part as to why our offense has struggled in my eyes. What seemed to help Wilson in this game on his long throws was to utilize his mobility. On his 51-yard connection with Doug Baldwin, Wilson scrambled for more than 5 seconds before seeing that Baldwin has space down the field to make a play. Although it was not Russell Wilson’s most glamorous performance of the season, some of his throws on Sunday should build confidence heading into Super Bowl XLVIII. Left Guard Shuffle: Last week the Seahawks started rookie Michael Bowie at left guard and James Carpenter was inactive. This week was the exact opposite with Carpenter starting and Bowie standing on the sidelines inactive. I understand that competition is at the heart of the Seahawks philosophy but now, in the most important games of the season, is not the time to play the left guard shuffle. Stick with who has the hot hand. Who’s to say that Paul McQuistan won’t start against Denver in two weeks? 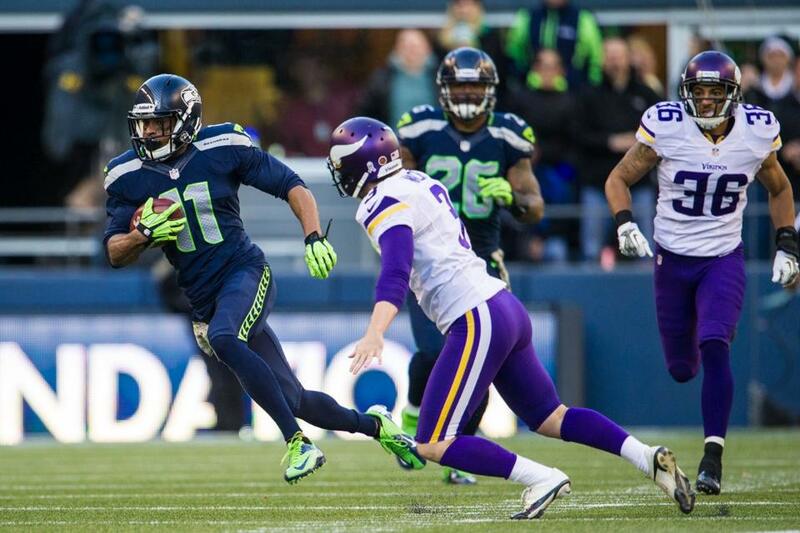 The Seahawks must stabilize the left guard position. I do not want to look past the Super Bowl but I think I may know what the Seahawks should target in the first round of the 2014 NFL Draft. Kaepernick’s Wheels Keep 49ers in Game: This game would not have been as close if the Seahawks defense had been able to stop Colin Kaepernick from scrambling in the first half. Highlighted by a 58-yard scramble, Kaepernick led all 49ers rushers with 130 rushing yards, 114 more yards than the next leading San Francisco rusher and 116 yards more than primary running back Frank Gore. The quickness of Kaepernick fooled the Seahawks defense for much of the first half and the Seahawks did a fantastic job of making the necessary adjustments at halftime to shut Kaepernick down in the second half. Aside from Kaepernick’s legs he did not do a whole lot. Kaepernick ended the day 14/24 for 153 yards passing with one touchdown and 2 interceptions, each of tremendous importance and which ultimately cost the 49ers the chance to play in the Super Bowl. “It Was Only a Matter of Time”: The 49ers led the turnover battle at halftime 1-0 and right before the start of the second half my Dad leaned over to tell me that it was time for Colin Kaepernick to screw up; that we had shut him down through the air in the first half and that it was only a matter of time before he made a mistake. The 49ers made 3 mistakes in the second half and Kaepernick made two of them. The first came with 7:37 remaining in the game when Kaepernick dropped back and tried to get the ball to Michael Crabtree on the far side but instead threw it right into the hands of Kam Chancellor. That turnover resulted in an insurance field goal to make the game 23-17 Seahawks. The second mistake turned out to be the biggest play of the year, and perhaps the most important play in franchise history. With the ball at the Seattle 18-yard line with less than 30 seconds left to play, Kaepernick saw one-on-one coverage in the endzone on a fade route. He threw intended for Crabtree but the ball was tipped by Richard Sherman and hauled in by Malcolm Smith to seal the Seahawks victory. Like my Dad said, “it was only a matter of time” and that time came with 22 seconds remaining and there was nothing the San Francisco 49ers could do about it. Random Thoughts: Is it just me or is the general crowd sitting around me becoming dumber and dumber as each game goes on when it comes to “cheering education?” I felt like there was a lot of cheering when the offense had the ball and when the 49ers fans tried to get loud when the Seahawks had the ball, the 12th Man would boo, making the stadium even louder. That is a big no-no and was quite frustrating… Perhaps the Macklemore performance at halftime re-energized the crowd. We were down 10-3 at halftime and the crowd seemed fired up at the start of the third quarter. That was very much needed and maybe it’s not too crazy to think that Macklemore’s impact played a key role in how the second half turned out… It’s too bad not everyone got a rally towel. It was a scattering of white waving around before the game, nothing like what it has looked like in previous games where rally towels were the giveaway… Paul Allen raised the 12th Man flag this week which in my eyes was a very safe choice. I still would have loved to see Mike Holmgren raise the flag… We went to the Nest and then over to the Pyramid Alehouse for lunch before heading into the stadium. Since this was going to be the last home game of the season I guess we wanted to make the rounds… I may have tried the grossest beer ever on Sunday. Pyramid has a seasonal brew called “Weiss Cream” which tastes like if you sprayed whipped cream into a glass of water. Yuck. The tap handle was really cool though; a waffle cone full of vanilla ice cream… Time to start packing for New York City. I leave a week from Wednesday! Moving Forward: Over the next week I hope to hop on at least a couple of times with various posts. I am unsure what my computer status will be for the last half of Super Bowl week, Super Bowl weekend, and the two days following the game. If I decide to take my computer with me to New York, my preview of Super Bowl XLVIII will come on its normal day; the Saturday before the game. If not, I may be forced to publish my Super Bowl preview a few days early. I will update with more information when my plan becomes clearer. We are one win away from a world championship. Enjoy this, 12th Man but understand our job is not done just yet. Go Seahawks! After 36 days of training camp and 4 practice games, the preseason is finally over. The Seahawks finish the preseason 4-0 for a second straight season after defeating the Oakland Raiders 22-6 at CenturyLink Field on Thursday night. Although the offensive starters only played one series, it was enough to gage our level of readiness for the regular season. Here are some things I took out of Thursday night’s game. Wilson is Ready: It took only six plays but the starting offense led by quarterback Russell Wilson proved that they are ready to go for the regular season. Wilson went 3/3 for 68 yards, including a 50-yard deep pass to Stephen Williams. Wilson also added an 11-yard run for a first down. The thing that stands out was how easy Wilson made the opening drive look. Granted it was against a very unimpressive Oakland defense but I felt like the drive told the 12th Man “see, I still have it. I’m ready. See you in the regular season.” The offense was able to stay healthy for the most part. Stephen Williams left the game after his long reception due to a concussion. Regardless, all projected starters made it through the drive without a hitch and I am convinced we can go out and move the ball in the regular season just like how we have done in the preseason. Hauschka is Ready: I remember during training camp last season kicker Steven Hauschka could barely kick a 58-yard field goal. Months later, the final play in Atlanta last season could have been a 65-yard field goal attempt to win the game and send the Seahawks to the NFC Championship game if Hauschka was healthy. It seems as though Hauschka trained this offseason to prepare for such a possibility. During training camp Hauschka was able to kick 58-yard field goals with ease and tonight he booted 5 field goals; 3 of which from 50 yards or more. His first kick, a 56-yard field goal was a career high and looked strong enough to have been good from at least 60 yards out. Hauschka is definitely a better kicker than he was last year and he will be a valuable asset to put up points if drives stall in the opponents territory. Who Helped Their Stock: After Thursday’s game I would be stunned if Benson Mayowa does not make the team. Mayowa recorded another sack in the second half and did a great job applying pressure to Raiders quarterbacks Matt McGloin and Tyler Wilson. Thanks to Mayowa, Wilson made several forced throws off of his back foot. Given the recent injuries along the defensive line, Mayowa could find himself on the week one roster. If the Seahawks decide to cut Mayowa, I believe he will not clear waivers and he will be on an active roster somewhere else in the NFL for week one. Who Hurt Their Stock: For the past several weeks I have mentioned that I believe wide receiver Chris Harper needs to make more of an impact in the preseason. He may have stamped his ticket out of Seattle on Thursday night. Harper dropped two wide open passes, one of which was an underthrown pass into the endzone which would have surely been a touchdown. The ball hit Harper in the chest and he could not bring it in. Harper, in my eyes, is the sixth wide receiver on the current roster. It is up to the coaches to determine if 5 or 6 wide receivers make the week one roster. If only five make the team, Harper will be cut. Oakland Scouting Report: The Oakland Raiders did not show me anything special from any of their units this week. Terrelle Pryor was unable to conjure up a touchdown drive and the starting defense could not stop the Seahawks offense. Pryor had a golden opportunity to show the Raiders coaching staff he could win the starting quarterback job. He played pretty mediocre football, going 3/8 for 31 yards and one interception. 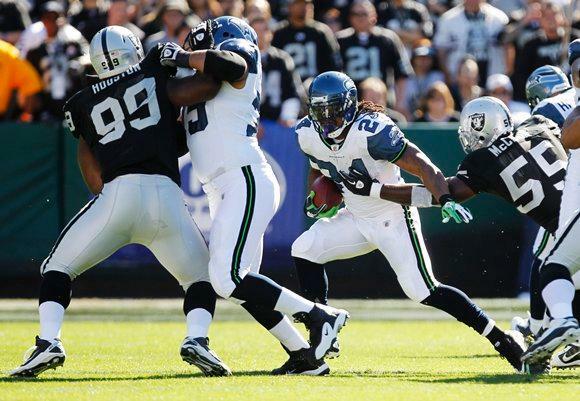 The only highlight I saw out of Oakland was their ability stop the Seahawks running game. 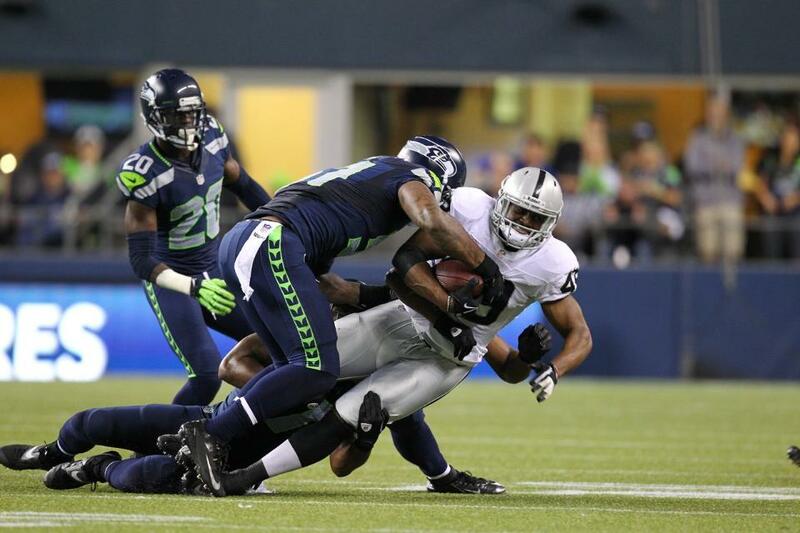 The Raiders only allowed 53 rushing yards while gaining 126 rushing yards of their own. As a whole however, I think it is going to be a long season for Oakland Raiders fans. At this point I would not be surprised to see them in contention for the number one overall pick in the 2014 NFL draft. 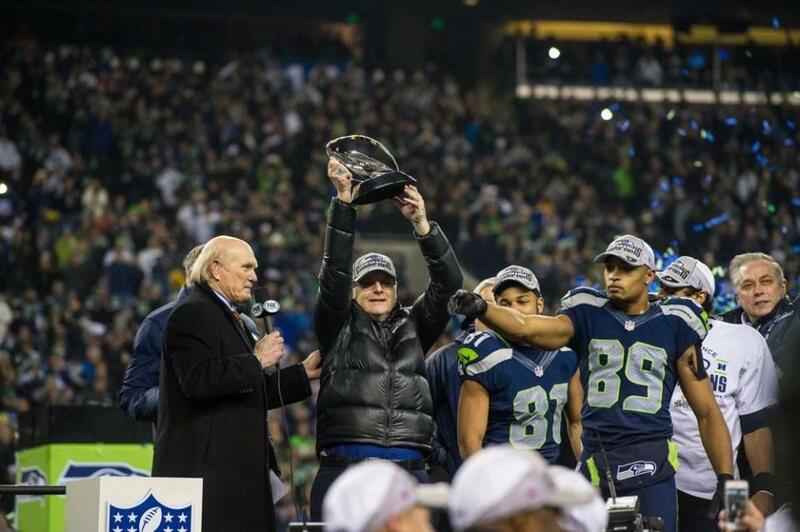 Random Thoughts: The Seahawks were able to limit their penalties significantly this week. 8 penalties total for 65 yards… The Seahawks wore blue pants and blue jerseys this week again… There was very interesting scene at the bar before the game. A Seattle rap group which I believe calls themselves “Neva Scared” filmed footage of their music video for their Seahawks themed anthem. It was kind of cool but was low budget and not very impressive. Just a hunch, but I don’t think they’ll be the next Macklemore & Ryan Lewis… The starting defense was introduced this week… My buddy Josh was only able to get one Raiders autograph before the game. He had terrible luck, as a thunder and lightning storm along with heavy rain postponed pregame warm-ups for both teams. The funny thing though was the rain stopped shortly thereafter and was clear for the rest of the night… You can clearly tell who season ticket holders are and who are not. Maybe it is appropriate to try to start “the wave” in the first quarter at a Husky game or during a Mariners game but NOT during a Seahawks game. In general, preseason games are more for the casual fan who are not fortunate enough to get tickets to a regular season game… At the end of the game the following was announced to the crowd: “we’ll see you on September 15th when your Seattle Seahawks, on Sunday Night Football, host the San Francisco 49ers.” This got a pretty loud cheer from the scattered fans leaving the game. I am already getting excited about the home opener. Can’t overlook the season opener though. Speaking of which… 10 days until the season opener! The Seahawks have until 3pm on Saturday to make their final roster cuts to get the active roster down to 53 players. I will publish another roster analysis post Saturday night or Sunday morning. And make sure to check back on Saturday, September 7th as I preview our week one matchup against the Carolina Panthers. Go Seahawks!